In this new series, we’re going to pair authors together and have them discuss anything and everything that authors discuss. In this inaugural conversation, Gabriel Blackwell and Robert Kloss discuss the similarities between their books, historical nonfiction, blurbing, and more. Gabriel Blackwell: “Historical fiction” seems naïve to me even as a concept, and I’m allergic to categorization. But if there is anything in Amazon’s sales algorithm to connect our books, it would have to be that, right? That we’re both exploring/appropriating history in our fictions? So, why bother with the historical? I mean, the Greely expedition happened. The Civil War happened. Lincoln’s assassination happened. Why write about them or around them? Why not just make something up out of whole cloth, set it in the present, set it in the future, Middle Earth? Robert Kloss: I always liked books like Reed’s Flight into Canada and Coover’s The Public Burning—historical satires. But that’s not the kind of novel I set out to write. And, in most ways, it’s not the kind of book I did write, although I think that’s the most obvious part of my book. It kind of just happened. I set out to write about a man’s fear of mortality and his extreme grief and that led my to Lincoln’s morbid grief over his son’s death. The Civil War then seemed like a natural subject—it allowed me to dig into personal griefs in an epic way, while also letting me make a kind of broad comment about American past and present. But the historical side of the novel emerged very organically out of the more imaginative side of the story. I began with alligators. And then it becomes a kind of game, doesn’t it? The process of inspiration, of blurring the lines between imagination and historical record, between fact and Truth? So let me throw it back at you a little bit, because you’re maybe even playing with the form a little more than I do—you’re not just manipulating biography and historical record, but you’re also playing maybe the two most important and famous novels of their genre, The Maltese Falcon and The Big Sleep. So the question then is: Why rework the texts? And also, where was your starting point? What was your process on this? GB: It seems to me that Shadow Man is a book about creation or a book about the failure to create. Why rework the texts? Because Shadow Man’s a book about creation and the failure to create. The men who wrote The Maltese Falcon and The Big Sleep were terribly confused men, men who made mysteries out of their lives while writing books about men whose jobs were to solve mysteries. It’s not their work I’ve appropriated—or not only their work I’ve appropriated—but their position, their predicament. But it is/was my position, too, where I found/find myself. What I’m trying to say is that this wasn’t a book that could have been written from a zero point. I don’t believe that such books exist. But that’s another subject for another time—this was a book that needed a father or fathers, a heritage that was both obvious and mysterious. The book is a paternity suit. Which brings us (back) to fatherhood, something I found particularly important to The Alligators of Abraham. The you of the novel is a son with a very strong father, but it’s a you, not a he, not an I. Why is that? Why the second person? David Ohle described your book as being “led along dark alleys of American history by an all-seeing voice-over narrative,” but, as “all-seeing” as it is, it is also, oddly, intimate, perhaps by virtue of that you. RK: I would like to never again write about the feelings or thoughts of any of my characters, especially when writing about the bizarre. I would rather focus on physicality—defining through action. The second person allows for that kind of distance, while also creating the kind of intimacy that you mention. There is also something about the second person that lends to a voice and language driven narrative, while at the same time limiting the kinds of character-related concerns that a first person narrative may have. Finally, second person allows for a sort of sweeping vastness—Ohle’s all-seeing narrator—that I find necessary to writing the kind of book that interests me. At different points in the writing of Alligators, I did toy with making the second person into a kind of first person. And then for a while I toyed with writing the book as a dialogue between Robert Lincoln and the “you” character. The structure of the first few drafts was much less straightforward. And I found those experiments very frustrating and limiting and dull. The more and more I moved away from characterizing the narrator in anyway, while also retaining the qualities of a narrated story, the more liberated I felt. There is just something very sweeping and from the clouds or burning bush about writing this way. I think in many ways my goal is to show everything while telling nothing. I think mystery is a very important element in all great writing. I would rather not have things explained away. And, of course, you use multiple perspectives in Shadow to deepen the mystery, rather than solve it. So, in my mind, our books may be more closely linked by our use of language and perspective than our use of history. Your book is maybe even more driven by language and voice than mine. And you certainly use more perspectives than I do. I’m hoping you’ll comment on your use of language—I find it impressive. In particular, I’m curious about how you constructed the voice—your influences, your method in writing it, and so on. And then the other linked question I have, is about the use of Gabriel Blackwell as a character at the very end. What was your thinking in using what is essentially an aspect of meta-fiction to deepen the mystery? Usually the entrance of the author diminishes the mystery—at least in my experience. GB: Maybe it’s a question of genre. I guess I’m okay with the publisher calling Shadow Man a novel (even though I did ask that it be called a biography on the cover, to be internally consistent; that doesn’t seem to have stuck), but only because I recognize the novel as novel, as being one of the most pliable literary forms. I’d feel just as comfortable talking about it as an essay (or even a memoir), though, as that’s how I see my role with regards to this material—as an essayist. I was as careful with facts as I was with fictions, and the material, after all, already existed. I just shaped it. Given that relationship, I don’t really see it as a metanarrative, though I will concede that it probably is, in a Schrödinger’s cat kind of way. I love “something very sweeping and from the clouds or burning bush”; I think you’re better at describing your style than I am at mine. I can see your you effacing the narrator; that’s an interesting aspect of your use of the second person, maybe of the second person in general. My natural inclination is to move in an opposite direction—to focus as intently as I’m capable on that entity, whatever/whoever it might be, to inhabit it. I’m always thinking in terms of how the teller should be telling the story, what story it is, what form it should take, and what that all means for the resulting language. It’s the only way I’ve found to get the language right. It’s slightly puritan, I think, or maybe just functional, but I tend to lose patience early with writing that doesn’t exercise some care and consideration there. Voice is all there is. So, around the time that I was having to think about who to ask to blurb Shadow Man, Matt Bell posted something about blurbs on Facebook that made complete sense to me. It was something like: “Choose the company you want your book to keep.” Less aphoristic, probably. Maybe this was no part of your thinking, but can I ask why you chose Adam Braver and David Ohle for your blurbs? I’m a huge fan of Ohle’s work, but I don’t think I would have thought of him while reading Alligators. As for Braver, I have his latest novel, Misfit, and I’m eager to read it, but it will be my first Braver. RK: Well, first, that’s an interesting comment about In Our Time. I hadn’t thought about that book—I read it years and years go, in college, I think—but I can see where the devices are slightly similar. Actually, I was watching a lot of Malick films when I was finishing the later stages of the manuscripts, and I think that’s where the idea of the italicized sections came from, like whispering over the gunfire and slaughter. On the page it becomes something else, of course. As for blurbs: it’s funny you mention Matt, because I actually consulted him early on—and he gave me much the same advice as you mention. So I wanted to use authors who wrote about the Civil War or the post-apocalyptic. We actually toyed with getting Civil War historians to blurb the book or fake Civil War historians or even use Lincoln’s words, somehow. Finally we settled on these two. Ohle’s novels were early inspirations for Alligators—Ohle’s books taught me to free up my imagination and to be fearless, and I think those ideas, plus the dystopian elements—are apparent in Alligators. So it was natural to try for him. Adam Braver was actually Matt’s suggestion. I was aware of his JFK book, but not Mr. Lincoln’s Wars. I picked up that book and enjoyed it—the lyricism, the way he wrote history as literature. And I liked the idea of someone like Braver—who has a completely different approach to lyricism and historical fiction—taking a look at the book. The blurbing process is kind of strange, I think. I’m uncomfortable with all of these parts of selling the book, because they boil the novel down into little understandable parts. Little nuggets of wisdom. I think it’s unfair to The Alligators of Abraham to call it a “post-apocalyptic Civil War novel” but that’s evidently what I tried to reduce it to when choosing those two authors to blurb the book. I suppose that’s what we’re doing here, and probably each of us resisting in our own way, right? Reviews, jacket copy, blurbs, . . . and whatever else is out there, it’s all about finding a way of reducing something hopefully complex and, in a way, kind of inexplicable into something that will sell the public on our work. So, I think I coined “post-apocalyptic Civil War novel” just now, which is what I’m going to call Alligators whenever I’m approached about it, at parties or on the street (ha). So, now it’s your turn. What were you trying to boil your novel into when you chose your blurbers? How do you go about presenting your book in easy to swallow pills? GB: I think the italicized sections of Alligators do come across as oral, as vocalized. And, again, I like the way you describe it: “whispering over . . . gunfire” captures it perfectly. (Though I thought of Herzog rather than Malick; hope you don’t take that as an insult. Herzog describing Even Dwarfs Started Small: “an attempt to make inner states transparent . . . realized in a kind of nightmarish horror vision.” ANYway.) I think I am, in general, much less successful in describing anything having to do with me or what I’ve done in a way that makes any kind of sense or seems at all appealing. It’s less a matter of resisting—though I’ve done plenty of that with this book—than of incompetence. I plead awkwardness. I plead stupidity. 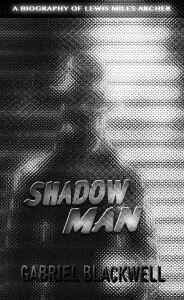 The only way I could be of any help with Shadow Man’s jacket copy/description was to think of that piece of writing as part of the book, part of and consistent with one of its narrators. Instead of trying to compress everything into some sort of capsule, I tried to think of it as a knob or a handle. I still got totally frustrated and hated doing it, but I hated it much less than my earlier attempts to encompass the whole of the thing. It seems to me that any successful novel is at least a little shaggy and messy, necessarily. If it is something that could effectively be communicated in a paragraph, the natural question is, why hasn’t it been? I mean, why write more than that paragraph, right? Obviously, this kind of thinking explains why I will never write a bestseller. With my exceptionally kind blurbers, I was attempting to make up for my own inadequacies. I tried to triangulate the thing I had written, to at least plot the craft and the spirit behind it, if not the subject. I did start out thinking in terms of subject(s), and I debated whether to ask someone like John T. Irwin, who has written a couple of great books about mystery and noir, or Richard Layman, whose work on Hammett was tremendously helpful to me. But I had trouble keeping up the pretense, maybe, or maybe I just couldn’t resist one good wink at the reader. Speaking of readers, even though I tend to be shark-like in my reading, but I can’t see not rereading The Alligators of Abraham. The excesses of language, the indelible imagery, the cadences, the bizarre and intriguing characters—it was tremendously satisfying, a rare book. Aside from that rereading, though, when can I read more from you? What’s next? I think you said that you’d completed another novel, yes? RK: The novel you mention is titled Let the Dead Bury Their Dead. It’s in the style of Alligators, but it shows a natural growth from Alligators. It takes it’s time a little more than Alligators—it lingers more. And it focuses more on their characters, their relationship and fears and atrocities, a little more. I am more proud of it than anything else I’ve to this point done. The novel does not yet have a publisher, so we’ll see what yet happens with it. I do have a shorter work appearing in 2013—a chapbook co-written with Amber Sparks called The Desert Places. It’s a series of linked flash pieces that traces the evolution of a monster from the beginning of humanity through the end. Matt Kish will be illustrating and Curbside Splendor will be publishing, in October I believe. And what about you? I know you have another book that is now available for pre-order. What’s that one about? Is there anything else on the horizon? GB: I have a collection of fictions and essays that’s just come out, Critique of Pure Reason. And then I’ve “edited” another book called The Natural Dissolution of Fleeting-Improvised-Men: The Last Letter of H. P. Lovecraft, that will be out in October. It feels very strange to have three books come out in just under a year—strange, and a little tiring. I hope any readers I might have aren’t as sick of me as I’ve become. I don’t think of myself as a particularly fast or productive writer, despite this anomalous year. I started work on the next book after finishing Natural Dissolution this summer and handing it over to the publisher, and I’ve been adding to it bit by tiny bit, but it still hasn’t achieved that point where its momentum determines my schedule—you know that point? It just feels like something one does right now, like a habit one isn’t very proud of. I’m probably not supposed to say that, huh? In all honesty, I don’t believe in anything I’ve written until it has a complete shape, until I can really get started on the revision. I think of myself as a reviser, not really a composer. RK: I can relate to this idea. There are times when I’m holding out buckets to catch the words, to paraphrase Saul Bellow, but more often now I find it necessary to slowly throttle the thing to life. I think that’s very natural, for growth to come through an uncomfortable struggle. Purchase Shadow Man: A Biography of Lewis Miles Archer from Civil Coping Mechanisms here. 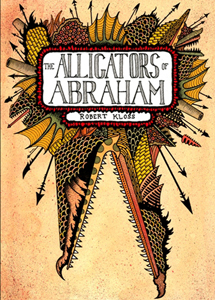 Purchase The Alligators of Abraham from Mud Luscious Press here. 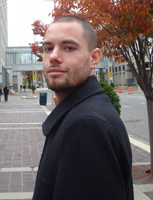 Gabriel Blackwell is the author of Shadow Man: A Biography of Lewis Miles Archer and Critique of Pure Reason. He lives in Portland, OR. Robert Kloss is the author of How the Days of Love & Diphtheria and The Alligators of Abraham, both from Mud Luscious Press.